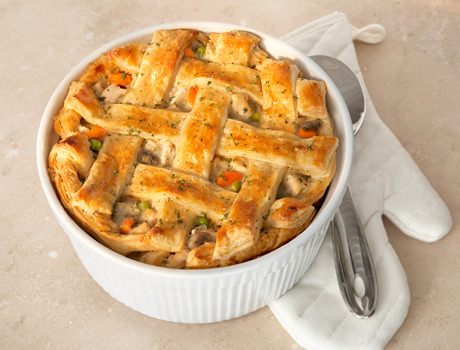 A light and flaky puff pastry crust is what makes this pot pie the ultimate. It's a great way to turn leftover chicken and veggies into a whole new and delicious dish. Heat the oven to 400°F. Unfold 1 pastry sheet on a lightly floured surface. Roll the pastry sheet into a 12-inch square. 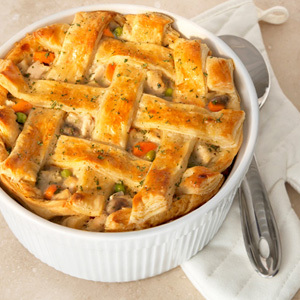 Press the pastry into a 2-quart round casserole. Trim the excess pastry. Prick the pastry thoroughly with a fork. Place aluminum foil onto the surface of the pastry. Bake for 25 minutes. Remove the aluminum foil. Heat the butter in a 12-inch skillet over medium heat. Add the carrots, onions and mushrooms and cook for 5 minutes or until the vegetables are tender-crisp, stirring occasionally. Add the flour and cook and stir for 3 minutes or until the flour is golden brown. Slowly stir in the broth and heat to a boil. Cook and stir until the mixture boils and thickens. Stir in the mustard, thyme, black pepper, chicken, peas and 3 tablespoons parsley. Remove the skillet from the heat. Unfold the remaining pastry sheet on a lightly floured surface. Cut the pastry sheet crosswise into 6 (1 1/2-inch thick) strips. Spoon the chicken mixture into the casserole. Weave a lattice pattern over the filling with the pastry strips. Trim any excess pastry. Sprinkle with the remaining parsley. Place the casserole onto a baking sheet. Bake for 45 minutes or until the filling is hot and bubbling and the pastry is golden brown.